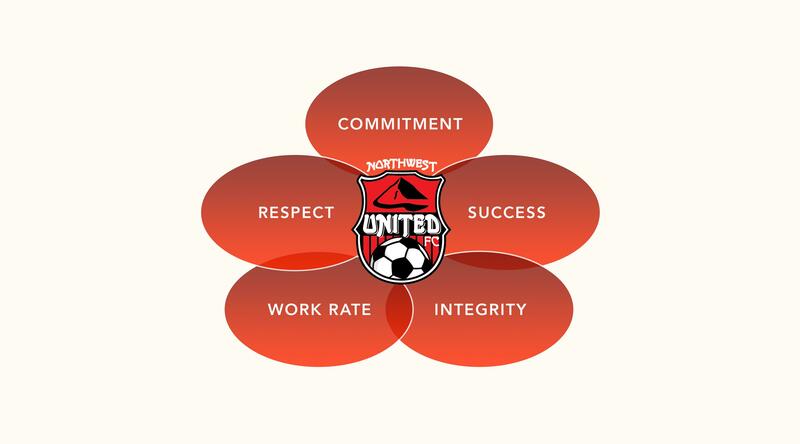 To deliver and express a quick, entertaining, and intelligent style of play replicated throughout Northwest United teams and ages. In possession we aim to build up play through the thirds swiftly and intelligently, identifying when to penetrate the opposition. Out of possession we look to identify when to win possession back early and efficiently as possible. Our philosophy is to bring a simple structure and model in finding players with potential and nurturing that talent while giving them a clear pathway to where they could go as a part of our club. The environment we create will place players where they are interspersed with similar levels of talent and the ability to push one another. In this environment they will be challenged and tested both at practices but also on game days where they are playing against the best competition at US Youth Soccer and the Regional Club League. Playing with and amongst equal or better ability is key to improving each week and together try and attain personal and team goals. · Success – looking to always achieve all formats of success. Players looking to be successful with results and player development. Coaches to successfully progress and develop every one of their players. Parents to successfully support their child and their club. · Integrity – being honest and true to yourself. Players to show integrity to themselves and their team. Coaches to have high morals towards their team and club and be honest in the face of diversity. Parents to hold themselves and players accountable. · Work rate – Contributing their highest effort in everything we do. Players having the focus and determination in all aspects of NWU. Coaches working their hardest to deliver the NWU way. Parents identifying and mirroring efforts from players. · Respect – Being mindful and respectful of everyone in and around youth soccer. Players, coaches and parents are respectful of teammates, opposition, organizations and everyone related to the game.